A wide range of functions and performances are available to solve any process and temperature control option. Multifunction, multi loop programmable controllers. Panel mounting universal controllers and indicators. DIN rail mounting control & acquisition units. 1/32 DIN, 1/16 DIN, 1/8 DIN and ¼ DIN Industry standard sizes. Digital PID thermostat for heating and refrigeration purposes with 2 independent setpoints. It has Pt1000, thermistor NTC, PTC or J thermocouples inputs available. Heat/cool controller with optional analogue output, serial communications and remote input. Dual display, up to 4 relay outputs, optional current transformer input, analogue output, serial communications and remote input. Dual display, up to 4 relay outputs, start up function. 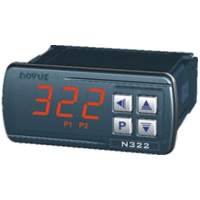 Optional timer, current transformer input, analogue output, serial communications, remote input, valve drive, double action, frequency inputand set point programmer. For continuous and discontinuous processes. 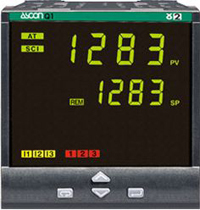 Programmable multiloop with real time clock and programmer to manage synchronised controls and sequences. Up to 8 analogue input and 8 analogue output. 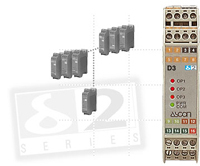 Up to 32 digital inputs and 32 digital outputs (expandable). Up tp 64 fully configurable and selectable programs (maximum 400 segments). Real time clock and Serial communications. 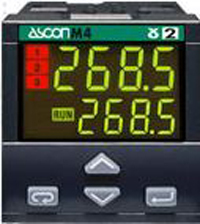 ASCON's process control experience and the increasing need for integration of the control systems have brought to the development of the deltadue® series temperature and control modules, single and dual loop. Units in the range include. Temperature controller with current transformer input. Dual loop controller/analogue acquisition module. Double action controller with continuous output.